U.S. Secretary of Agriculture Sonny Perdue made a stop at the Eagle Creek trailhead in the Columbia River Gorge on the evening of Tuesday, July 3, to learn about the Eagle Creek Fire, and hear about ongoing recovery efforts. Perdue was attending a fire recovery roundtable discussion hosted by Rep. Greg Walden, and they were joined by Gov. Kate Brown and several other state and federal politicians. The discussion centered on work that various state and federal agencies are conducting to restore areas of the Gorge damaged by the fire. The Eagle Creek Fire was started by a then-15-year-old boy throwing fireworks into the Eagle Creek Canyon west of Cascade Locks on Sept. 2, 2017. The fire started close to where the representatives met. In May, the boy was sentenced to pay $36 million in restitution and serve 1,920 hours of community service. The fire eventually consumed more than 48,000-acres in the Gorge. The highly popular Eagle Creek trail remains closed. Lynn Burditt, U.S. Forest Service area manager for the Columbia River Gorge National Scenic area, discussed how various government agencies fought the wildfire, and spoke about ongoing recovery efforts. Firefighters spent more than 40 hours hosing down the lodge at nearby Multnomah Falls to prevent the landmark from burning, she said. 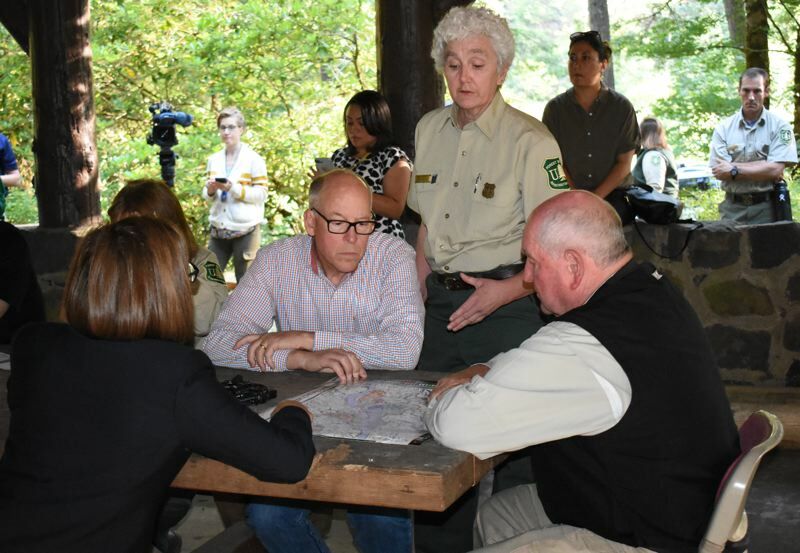 Burditt told The Outlook she was glad to get the chance to explain the effort of the Forest Service and other state agencies to address the issues still facing the Gorge. "It's always wonderful when you have an opportunity to be in a place, experience that setting, and hear the story of why this place matters," she said. At the roundtable discusion, Brown and Walden explained what the Gorge means to residents of the state. "This is one of the crown jewels of Oregon," Walden said. "It's a tragedy this fire occurred." "The Gorge is a special place for Oregonians. It feeds our souls," Brown added. The visit was part of Perdue's fifth Back to Our Roots tour where he visits farms, wineries and other agricultural areas. All the locations he visited were in the Pacific Northwest. "Much of our constituency is in the agricultural areas," Purdue said during a follow-up press conference. "It's important to get out and visit."